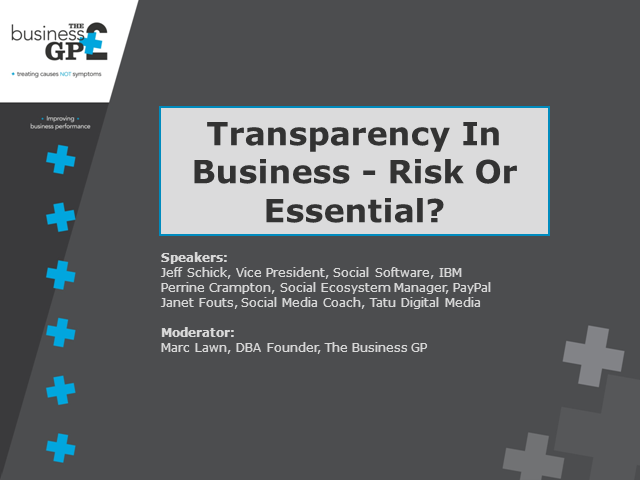 Transparency in Business - Risk or Essential? With globally distributed teams and an often remotely connected workforce, top businesses are looking for ways to further collaborate efficiently and in a transparent manner across various business functions and geographies. thing as excessive transparency? At this panel session, leading experts in the industry who have experience using collaboration tools successfully across various departments in the enterprise will debate the need for transparency and whether transparency is a risk for your company or essential for growth. Tom Geva, Senior Product Manager, BMC Software Inc. Adapt to the impact of Social – Mobile – Analytics – Cloud on your batch workloads. SMAC technologies can drive transformative value for your business—but only if your workload automation environment keeps pace with the complexity they can introduce. Learn how to meet the latest business requirements more quickly and efficiently. The future of work is already here. Entire industries are facing nimble, new competitive threats. Organizations, using old-school processes that hamper their employees’ abilities to react, risk being displaced by web-based, crowd-sourced start-ups. We have to re-think the model and act with certainty and agility. There is significant opportunity to transform businesses through a new model. One that enables an ecosystem of agent / employee engagement to better meet the expectations of how customers want to connect to companies. One that enables employee engagement in a way they want to work within companies. If there was a technology that helped you build strong engagement with your customers, increased employee productivity, and reduced marketing costs, would you, could you adopt it? Perhaps perceived risk is holding you back. Join us for an innovating discussion about Social and Risk-Averse Enterprises. Don’t miss out on fully capturing the business value of social. With so many different ways of communicating within your business, like phone systems, instant messaging, email, collaborative tools, social networks, video conferencing and even mobile, it might be overwhelming when deciding what communication solutions suit your business needs best. In this session, learn about the benefits and roadblocks in deploying mission-critical business communications and hear of the latest technologies that improve communication and collaboration within your business. Join IBM and Actiance to learn how to get the most out of Social for your business, while controlling the risks. The statistics are well documented regarding how Social can help grow your business. But many are slow to adopt Social aggressively because of fears of exposure and control. Join us to learn how IBM and Actiance have teamed to provide seamless integration of the Social tools you need and the governance and controls necessary to make Social profitable and easy to manage in your business. A conversation between Sandy Carter, IBM, and Kailash Ambwani, Actiance, about reaping the benefits of Social in business, while controlling content and protecting your brand. Tom Petrocelli, Research Director, Enterprise Social, Mobile, and Cloud Applications, Neuralytix, Inc.
Neuralytix has been tracking many of the trends that effect enterprise social network deployments. These trends present clues to how to deploy this type of enterprise social network successfully – or not. Understanding where the market for enterprise social networks is heading will provide vendors and IT professionals alike tools for successful new deployments and for enhancing existing ones. Join Paul Greenberg, Social CRM industry expert and author, to learn how customer engagement is being re-defined in the new era of social business. He will discuss new approaches for engaging proactively with the new breed of customer, from how to get their attention, acquire, and retain them -- not just as buyers, but as advocates. How you deal with the social customer will be the basis for your company's success or failure. Marketing’s world has changed more in the last 2 years than in the last twenty. Step one in leveraging these new social weapons is building a business case that shows others in the organization the impact on key business imperatives. This session will take social marketing out of the world of fluff and nice-to-have and will focus on key goals that it can drive. Real-world examples from major companies across industries – such as tech, retail, financial, and telecommunications – will also be highlighted that you can leverage in building your own business case. It all boils down to 2 choices: business as usual, or social business. Businesses that get social are building a company for the long game, creating a business model that endures with social at its core. Don't miss this live webcast where you'll hear Jive customers discuss how to use Social Business Software to win at engaging employees, customers, and the social web. Our panelists are visionaries who had the guts to say "no" to conventional wisdom and choose social early on, well ahead of the competition. If you haven't flipped your entire Web Content Management (WCM) strategy upside down, the sooner you do the better. In this session you'll learn how to turn user-driven content into a sustainable advantage by driving more traffic, better SEO, higher conversion rates and increased loyalty from your website content efforts while dramatically lowering costs. The five successful social strategies will draw on real-world use cases from organizations like Nike, Bank of America, RIM, and Intel to get on the fast track to success with social Web content management . Business is broken. We spend endless hours processing email, searching for information, and tracking down expertise. We get herded through business processes, and treated like machines. No wonder employees are less engaged than ever before. The social business revolution is fundamentally changing how employees engage, collaborate, and share information. In this webinar, you'll see how some of the biggest brands in the world are using Social Business Software to change the way work gets done. Explore latest tools and technologies including Online Communities, Social Networking, Collaboration, Social Search, CRM and Wikis and examine how those tools are changing the way companies work. Through thought leadership, expert analysis and best practices, the Enterprise 2.0 channel provides the information you need to successfully take your company to a new level. Title: Transparency in Business - Risk or Essential?